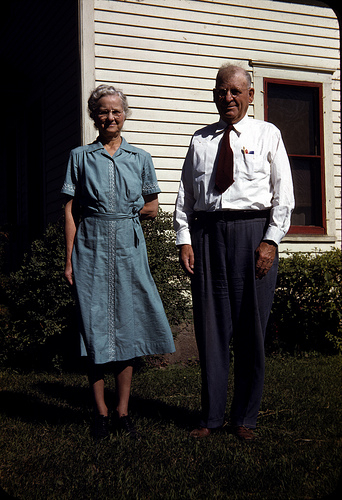 My grandparents moved into the house 88 years ago today. I was trying to figure out why I was feeling so complete in Murdock. Itâ€™s really pretty simple as my family has been here for at least 133 years and has lived in the same house since September 30, 1922. My grandmother Mary Jannet â€œJennieâ€ Foley and my grandfather, Martin J. Walsh Sr., known as â€œMartâ€, see photo above from the 1950s, were married at the Sacred Heart Catholic Church, in Murdock on Nov. 4, 1915. (They were assigned pew number 12 or about the fifth pew back on the left side from altar at the church.) They moved to the current family home located on the west end of town on Sept. 30 1922, according to an interview on Aug. 12, 1976 by Sister Julitta Walsh, a religious sister and relative. The land was formerly owned by an old four mill. Part of the mill foundation was used for the present home. The house was built in 1917 by John Murphy. Audio recorded on the iPhone 4. Itâ€™s been just over a month after I moved to Murdock from Florida, arriving on August 17, 2010 in Dublin Township, located southwest of Murdock, about 7:30 p.m., near the location of the family farm. The children of Steve and Lisa Collins were running and waving their arms at the side of the road when my car turned into their farm, seeming just like a scene out of movie. My marathon travel of four days and three nights by car from Florida was complete, a total of 1,766 miles. The Scared Heart Cemetery is filled with my relatives, including my brother David Walsh, living only short time in 1962. My father Martin J. Walsh Jr., grandparents and great-grandparents and others have their eternal resting places not far from the family house. Murdock continues to mark each day with the noon and 10 p.m. whistle, serving as marking times to eat and sleep, along with church bells on the top of hour, historically ringing to mark times to pray during the day from Scared Heart. The bells and whistles are a steady cadence, keeping the 303 residents in daily step for both body and soul. Life may appear to be slow in Murdock, but it is steady and appearing unending. My family continues to have deep roots in a land my great-grand father Michael Walsh moved to 133 years ago. Simply said, I am home in Murdock. Native Minnesotan Jannet Walsh is a blogger, columnist, journalist, photojournalist, terrier owner, hula hooper and more! Contact her at jannetwalsh@gmail.com. Click here to view full biography. View her other blog at http://jannetwalsh.blogspot.com/.